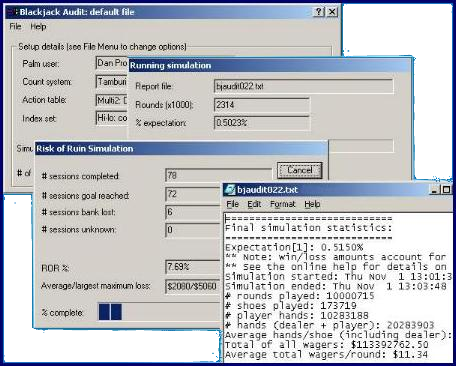 Blackjack Audit is a powerful Blackjack Simulator that will help you analyze every aspect of your game. This power-packed analysis tool runs millions of hands of Blackjack, building statistical data to tell you how well your count system is working. How much money will I make with my count system per hour, on average? What's the chance that I'll lose all of my bankroll, before I reach a certain profit level? Would I make more money, or less, if I change a certain action or index play? What will happen if I decrease, or increase, my bet spread? The casino I play at has several different Blackjack games with different rules and numbers of decks. Which one has the better profit margin? The authors of my count system say that I should get a 1.5% expectation. How can I verify that? Blackjack Audit is the only analysis program that will work with the count systems you already are using in Blackjack Counter. You can use this program with either the Palm version of Blackjack Counter, the Pocket PC version, or the Windows version. For the Palm version, simply hotsync your handheld device to the desktop computer where you installed Blackjack Audit, and you're all set! 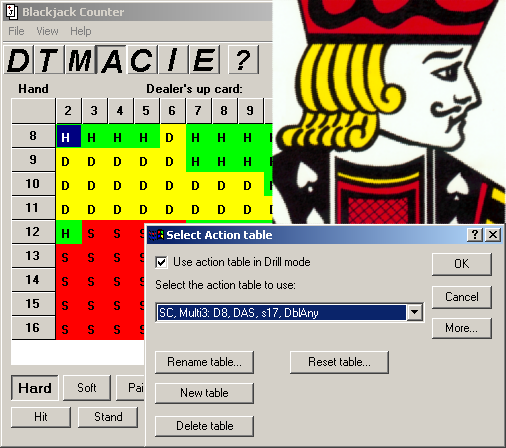 Using the Windows version of Blackjack Counter, the options are read automatically. For the Pocket PC version, simply enable File Synchronization in ActiveSync on your desktop, and the system data will be copied from your device. All of the count systems, action tables, and index sets are ready for you to use in Blackjack Audit.